Today i would like to inform process of How to activate Dialog Data Loan. Srilankan's premium mobile network Dialog introducing Dialog Data Loan facility which facilitate nonstop internet surfing for reasonable price. 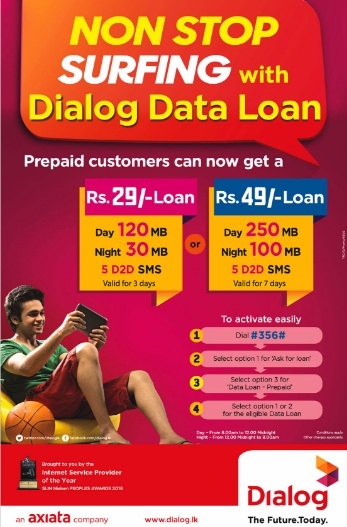 Dialog prepaid customers can now get a Rs 29.00 Dialog data loan or Rs 49.00 Dialog data loan. Dialog data loan Rs 29.00 package provide 120MB (day time) and 30MB (night time) data (pack valid for 03 days). Dialog data loan Rs 49.00 package provide 250MB (day time) and 100MB (night time) data (pack valid for 07 days). Select option 1 "Ask for loan"
Select option 3 for "data loan - prepaid"